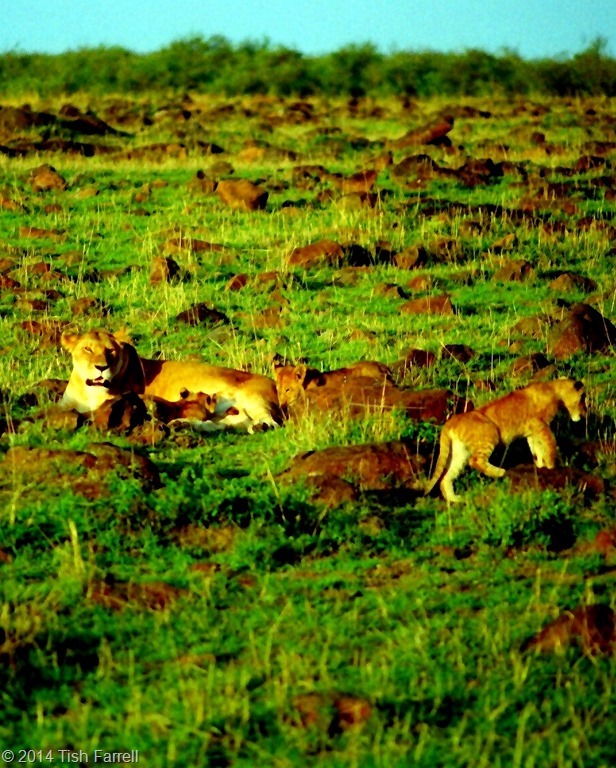 It is late afternoon when Daniel, our guide, takes us to the rock-strewn place where he knows the lions will be. The males are hiding away in longer grass, but the females and cubs are out in the open, enjoying the last of the sun. The light is spectacular. 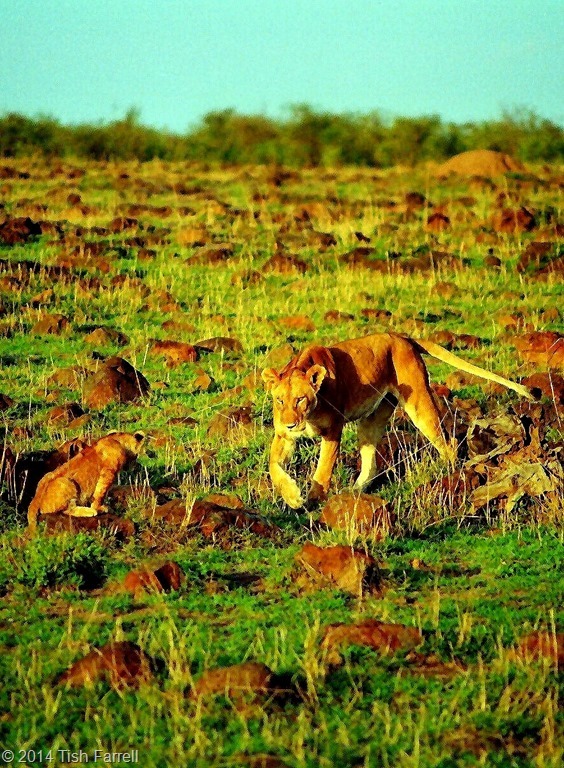 I wonder if the lionesses have chosen this place on purpose: because their young blend in so well with the landscape. In any event, they seem utterly relaxed. This mother (above) simply watches us as she feeds one of her cubs. There is another at her tail, disguised as a boulder, while the third one takes off on a small adventure. 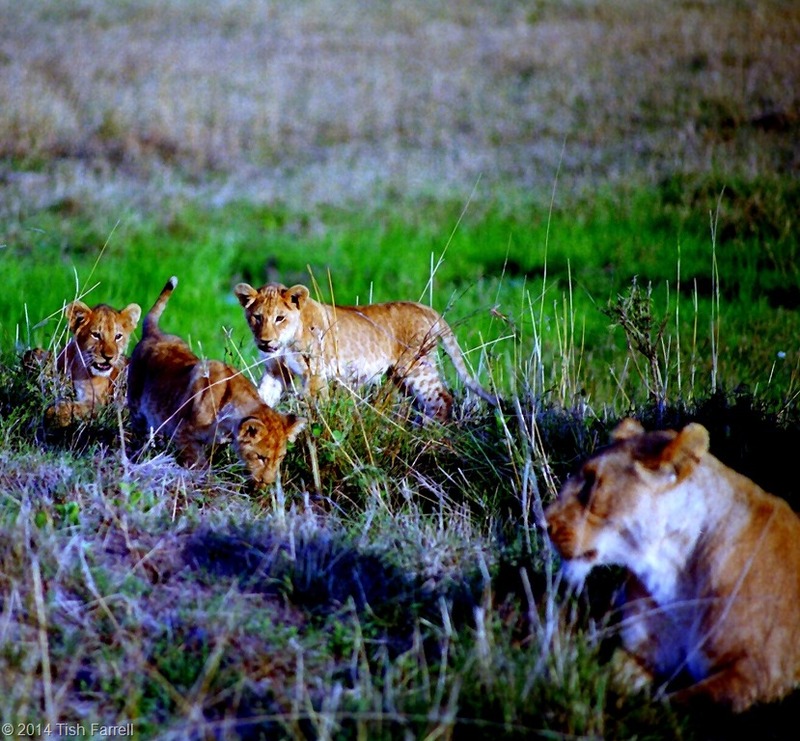 The quiet proximity of these lionesses is breath-taking, our intrusion on their family life above their notice. We watch them until the sun goes down and it is time to return to our camp on the Mara River. 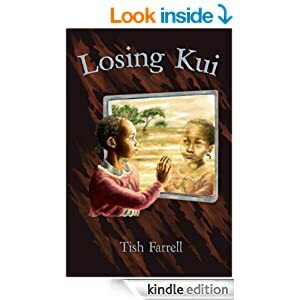 Posted on July 27, 2014 July 28, 2014 by Tish Farrell	This entry was posted in Africa, Photo Challenge, Travel and tagged Kenya, lions, Maasai Mara, photography, Tish Farrell Writer, Where's My Backpack Travel Theme. Bookmark the permalink. amazing how relaxed they are. The last picture nearly looks like a painting. Where does the blue color come from? Yes, aren’t they just. As to the blue hue – the original photos are quite old, and a bit unstable, so some interesting effects often emerge during the scanning, at which I’m not very adept. But the light at the Equator is always amazing at sunset. 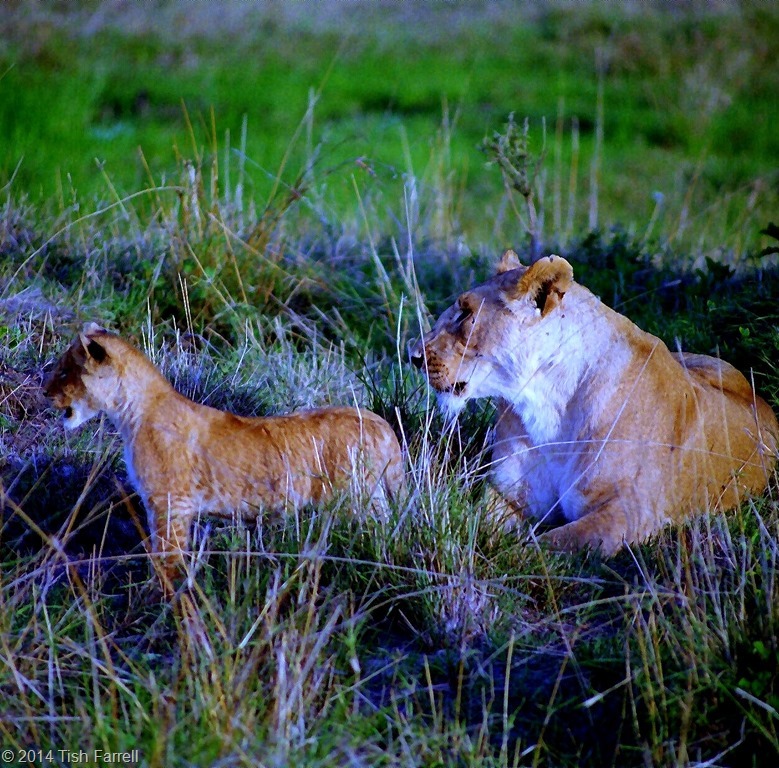 Yes, it’s so easy to forget that these big and little cats are BIG predators both in the present and in the making. What ever be the animal, they look so adorable when they are kids, right? Thank you, Tony and likewise on your post where I have just been. Mmm I expect you were moved by the people, the landscape and the endless coast. I worked there for 10 months. I had a little car and looked with envy at the LandCruiser ‘trains’ but on balance I did well to experience a great deal. Such a contrast with the ‘Gulf States’. I envy you that trip, Tony. We only dipped a toe into Oman. Early one morning after a night camping out in the Dubai desert with our Tanzanian guide. He wanted to show us an alfalfa farm. I know what you mean by the Land Cruiser trains. On Friday afternoon all of Dubai seemed to be driving out into the desert and putting up marquee sized tents. It looked like fun. We only had an ‘igloo’ and the sand was very very hard. What fabulous photos of these kings of the jungle. Thanks so much for sharing my post. Much appreciated! Lion cubs must be among the cutest of baby animals! Great photos Tish, and the story behind it makes me wish this last week before our next trip to Kruger flies by in a hurry! Wonderful! Always great to visit Mara. The little ones are too cute! 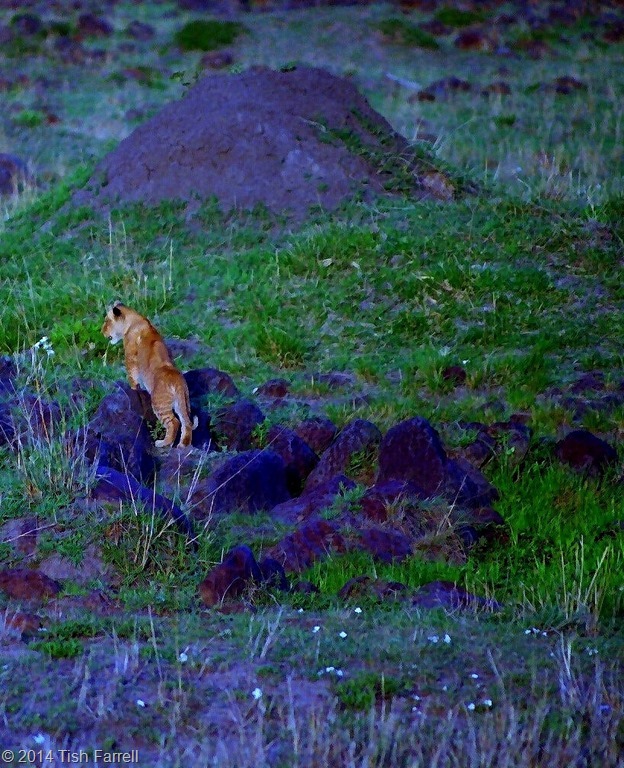 Your own tale of lion encounters made me think of these photos, Tiny. I love these pictures of the big cats. They are so beguiling, aren’t they, Shimon. Though it adds a frisson thinking they could eat you too. Hope you are well. 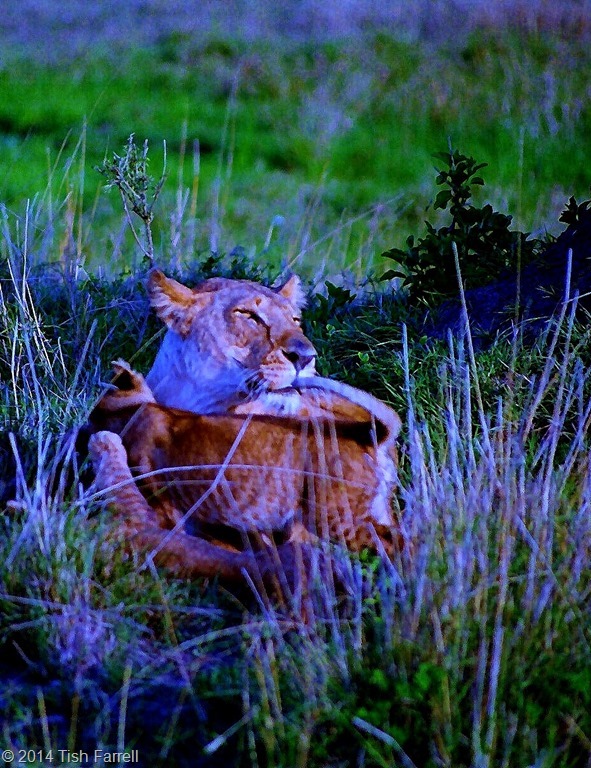 What amazing photos of these big cats! Thank you for sharing, Tish! I only rediscovered these photos this week, so I was very pleased too. Glad you enjoyed them, Amy. What a wonderful experience, and yes how well camouflaged the lions are in that landscape. Thank you. Janet. Great photos! I think it is so interesting that the surrounding boulders look like little cubs!